We recently had a little event that gave ample opportunity to apply Torah principles. One of my children, which asked to remain nameless, broke a drill bit belonging to Doug. She came to me and showed me the broken drill bit, not knowing what to do. She was very sorry, and I saw the opportunity to walk her through confession and all that goes with it. 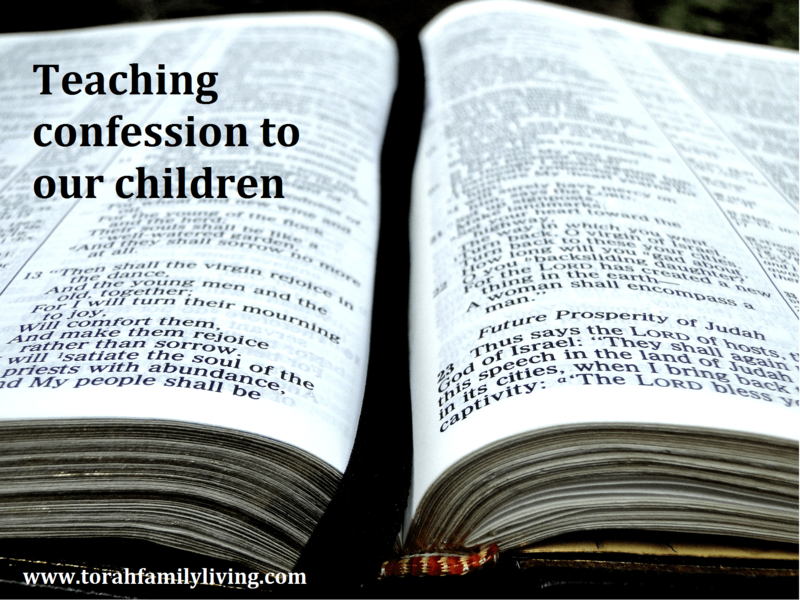 So let’s talk about teaching our children to confess. Owning up to our mistakes is something that we all struggle with. I still have to fight the temptation to hide my sin, or my forgetfulness, or my mistakes. Even the idea of someone being upset or disappointed with me is enough to silence my tongue. I don’t want my children to struggle with the same thing. Here are some ideas to help you teach your children this important lesson. Are your children afraid to come talk to you? Do you fly off the handle when you find out about things? I know, it happens. To encourage our children to confess their sins, we need to find an approach that enables them to come to us. I have found it helpful to just listen rather than allow myself to respond in an upset tone. I can quickly pray about the best course of action, and focus on finding a solution. Sometimes, I jump to conclusions that cause me to be more upset when listening would have clarified things. The best approach is often to listen, and then respond with, “Okay, we will talk about this later.” Don’t be afraid to buy yourself some time to make sure you are handling everything in a Biblical and helpful way. 2. Be a buffer, if needed. If you find that one or the other parent is struggling with the whole “be approachable” thing, be a buffer. My husband struggles with his reaction to bad news. But we still want our children to be able to confess their sins and tell us when things go wrong. So, often the kids come to me. I can handle all the smaller stuff, much like Moses set up a system in the wilderness. The leaders in charge of groups of 10 could handle the small stuff. They went up a level if they needed help. That’s how Doug and I handle quite a bit of parenting. It works well with our personalities, since I’m naturally more easy going. When I need help with a situation, I take it to Doug. I act as a buffer for the kids, so that if Doug is not happy with a situation, I can help him think it through and we can decide together on a course of action. The kids can confess without being frozen by fear of an unknown reaction. Just a side note, your children do not need to know that you sometimes act as a buffer for them. In the drill bit case mentioned above, I told Doug about it, but the perpetrator never knew. She was still expected to tell her Dad that she broke his drill bit. I simply paved the way a bit for her. 3. Reduce punishment if they openly confess. If there is nothing gained by confessing your sin, then what is the point? If our children voluntarily come to us and confess, we may still feel the need to dole out some sort of punishment, but it will be drastically less than if we found out about the crime and they tried to skate out of it. Many times, our children are obviously repentant, as my daughter was with the drill bit. In those times, we often simply pour on the forgiveness, and skip any consequences. This is such an important Torah principle that I feel it should never be skipped. If something gets broken or lost, it should be replaced. If someone is upset because of an offense, a heartfelt apology is in order. (I require hugs with apologies, because I have found that once a person can accept a physical hug, they are truly ready to forgive. If they won’t accept a hug, the offender has more work to do.) In our above case, she paid for a new drill bit, and gave it to her Dad. We all need closure. Once your child has confessed to you, make sure they know that it’s all over. They may need some sort of punishment (I am a firm believer in natural consequences whenever possible.) or they may need to provide restitution. They may need to apologize to those they have offended. But then they need to know that all is right in their world again. Tell them you love them. Tell them they are forgiven and restored. Our Heavenly Father has not only provided our salvation and forgiveness, but He makes sure we know about it. Do whatever it takes to make sure your child understands that “We’re good!” When my daughter gave the drill bit to her Dad, he gave her a hug and explained to her that he was concerned for her safety because he loves her. It ended well, with her knowing forgiveness and several important lessons learned. Just because you are the parent, doesn’t mean you are without sin. You need to confess sometimes, too. Apologize to your children when needed. Own up to your own mistakes. If you can openly confess your sins, it will become that much easier for your children. Get in your Bible to learn more about confession. I provided a couple verses above, but they are just the tip of the iceberg. Start with a word search in a Bible program with words like confess, confession, forgiveness, etc. What do you find? If you would like to know more about parenting with a Torah foundation, read The Children’s Ketubah Project. It provides lots of tips for being a better, more committed parent. Download our Story Discussion Starters printable for help on using story time, history reading, and other opportunities to teach your children Torah principles. Excellent post, thank you for sharing! I don’t always remember about restitution, so thankful you covered that. Thanks for stopping by, Dawn! I understand about restitution. I want to just make sure they apologized and get on with my day, but it’s definitely important to take them through the whole process, including restitution. Have a great day!